But the Tweedles don’t mind. They are a family that get around via other means. Then, one day, Papa Tweedles makes and exciting announcement. 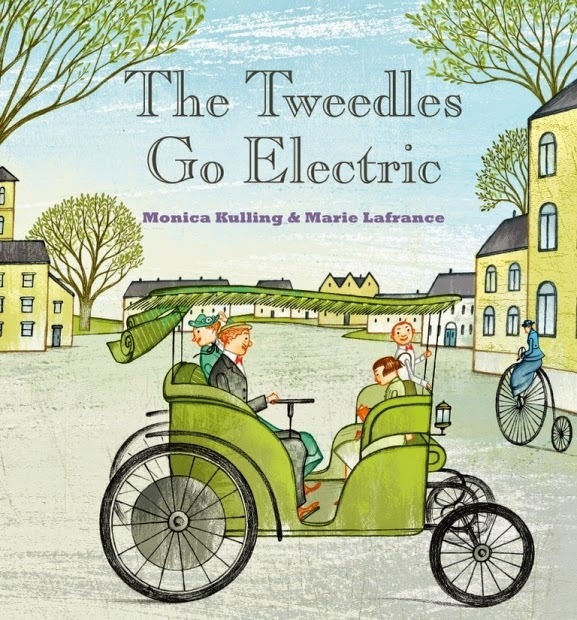 The combined experience of Monica Kulling (author) and Marie Lafrance (illustrator) bring you this beautifully illustrated story of The Tweedles -- an odd but endearing family -- as they buy an electric car to keep up with the times. It’s a story of an electric car that has heart. While gasoline clunkers and steam cars hog the roads, the Tweedles proudly drive around in their electric car – even though the car is slow. Smartly narrated with an environmentally conscious message that’s not shoved in your face, The Tweedles Go Electric is as delightful to read as it is to look at. Kids just may not bore of the delightful illustrations, so colourful and so interesting. Every night, storytime will become a wonderful new bonding time. "This car has an electric heart," replies Mister Mo, puffing on a fat cigar. "People don't want that. They want noise. They want smoke. Puff! puff! goes the cigar. "They want a car to sound and smell like a car."